Normal human gastric mucosal cells were examined by light and electron microscopy using lectins as a probe. 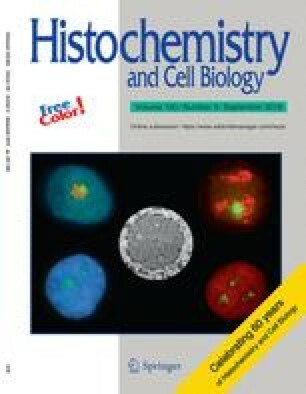 The ABC method was used with biotinylated lectins for light microscopy and HRP-labeled lectins for electron microscopy. The human gastric mucosal cells revealed specific binding patterns for each lectin by light microscopy. Among the lectins tested, in particular, DBA gave a characteristic pattern. It specifically stained the supranuclear region of surface epithelial cells and the perinuclear region of parietal cells. By electron microscopy, the stacked cisternae and the vesicles of the Golgi apparatus of the surface epithelial cells were positive for the DBA staining. These results show that the DBA-positive supranuclear region observed by light microscopy corresponds to the Golgi apparatus. In the parietal cells, DBA, RCA and ConA bound to the intracellular secretory canaliculi which are invaginations of the cell membrane running around the nucleus in the cytoplasm. Therefore, the tubular perinuclear positive region observed by light microscopy corresponds to the membranes of the intracellular secretory canaliculi. In addition, the ConA reagent stained the endoplasmic reticulum, Golgi apparatus, nuclear envelope, and cell membrane of the parietal cell, which explains the diffuse cytoplasmic staining observed at the light microscopic level with this lectin. Lectins have proved to be very useful for the evaluation of in situ cytochemical aspects of the glycoconjugates characteristic to human gastric mucosal cells.